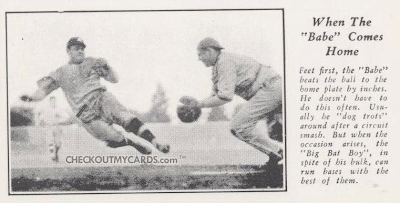 Building a type collection sometimes locks you into buying expensive-but-peripheral cards, like today's Babe Ruth-only issue. 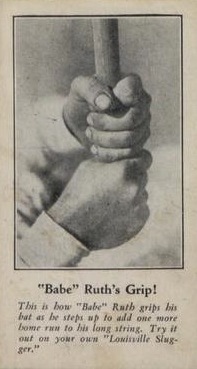 Despite the cost, most pre-war cards satisfy a yen for baseball history, offering a contemporary look at an early star. Other times, you get a curiosity piece. This #5 was my first pre-war Ruth--a big step for vintage collectors--but all I got was the Bambino's hands. 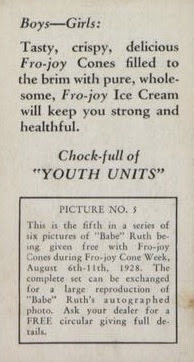 The Fro-joy ice cream company capitalized on Ruth's Atlas-like stature to issue this six-picture profile in 1928. Best I can tell, it went into ice cream lids, one card per creamy, tasty box. Studio poses comprise most of this set; Ruth's "flying slide" is the best of its two action shots. Fro-joy's sponsored cards use an unusual size and above-average printing techniques for the 20s, with thick paper stock, good quality photos, and glossy finish. At least the card quality exceeds comparatively humble strip sets like W519 and W521. The card back is one of my favorites, just for the phrase "Chock-full of YOUTH UNITS." And who wouldn't want to stay strong and healthful? Eat that ice cream, boys and girls! My #5 is a solid VG card, with no ice cream stains or other condition shenanigans. Rather than agonizing over creases or marks, a bigger concern for this set is whether the cards are authentic at all. People started reprinting them as far back as the 70s, often using unusual paper and other techniques that stand out like lighthouse beacons. (All cards printed on colored paper are reprints.) Some grading companies even stopped accepting Fro-joys to avoid authenticating a too-good-to-be-true reprint. 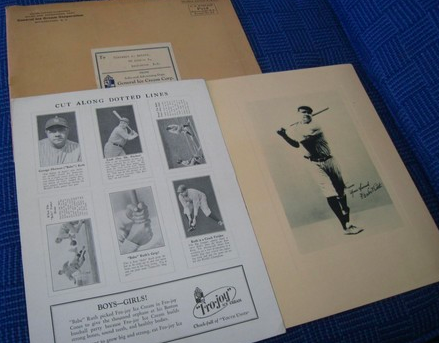 Uncut sheets and a premium photo exist in the auction marketplace, almost always accompanied by an original Fro-joy mailing envelope to provide provenance. We can assume the company offered them as promotional items and many dedicated fans took advantage. UPDATE: Here's a closer look at an uncut sheet. Value: Low-grade (but authentic) Fro-joy singles cost $150+ and reprints are around $5. Fakes / reprints: Fro-joy Ruths are one of the most reprinted cards ever, appearing on almost every color of paper, quality of photo, and even size of paper. I bought an SGC-graded card to be more confident that it was the real deal, though it's hard to be 100% at ease with Fro-joys. I had bought my Dad a #6 Fro-joy card for Christmas a few years ago. It cost me a pretty good amount. I am now glad as my Dad just passed this June and I have it back. I know that it brought him joy and I am sure it will bring me great memories of him when I look at it, and I hope my son will have great memories when I pass it down to him.